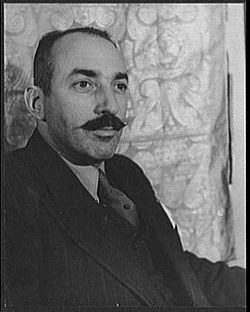 Alfred A. Knopf photo taken by Carl Van Vechten, March 31, 1935. Alfred A. Knopf (September 12, 1892 – August 11, 1984) was a leading American publisher of the twentieth century, founder of Alfred A. Knopf, Inc. Knopf began by emphasizing translations of great contemporary European literature, at that time neglected by American publishers, and specialized in producing books that were lauded for fine printing, binding, and design. His colophon, the borzoi, became synonymous with high quality books. He was honored in 1950, by the American Institute of Graphic Arts for his contribution to American book design. His authors included 16 Nobel Prize laureates and 26 Pulitzer Prize winners. He was the first publisher to use photographs in testimonials, and he advertised books in spaces previously reserved for cars and cigarettes. Knopf was a great self promoter who wore flamboyant shirts from the most exclusive tailors; was a connoisseur of music, food, and wine; nurtured a garden of exotic plants; and enjoyed rare cigars. His insistence on the best of everything, shaped his house's image as a purveyor of works of enduring value. After an excursion to the Western United States in 1948, Knopf became passionately interested in the national parks and forests, sparking his life-long activity in conservation issues. In 1950, he joined the Advisory Board on National Parks, Historic Sites, Buildings, and Monuments of the National Park Service, serving as chairman for five years. Alfred A. Knopf Inc. was virtually the last major firm of the old American publishing industry that included firms like Henry Holt and Company, G.P. Putnam’s Sons, and Ticknor and Fields. His company remained independent until 1960, when he sold it to Random House, Inc. After several sales and mergers since then, the Knopf imprint still remains a respected force in book publishing. Knopf was born into a Jewish family in New York City. His father, Samuel Knopf, was an advertising executive and financial consultant; his mother, Ida (Japhe) Knopf, died when he was four years old. He attended Columbia University, where he was a pre-law student and a member of the Peitholgian Society, a student run literary society. His interest in publishing was allegedly fostered by a correspondence with British author John Galsworthy. After receiving his B.A. in 1912, he was planning to attend Harvard Law School the following fall. That summer, however, he traveled to England to visit Galsworthy. He would recommended the new writers W.H. Hudson and Joseph Conrad to Knopf and both would later play a role in Knopf's earliest publishing ventures. Knopf gave up his plans for a law career and upon his return went into publishing. His first job was as a junior accountant at Doubleday (1912–13). While there he was one of the first to read Conrad's manuscript, Chance. Enthusiastic about the novel and displeased with Doubleday's lackluster promotion, Knopf sent letters to well-known writers such as Rex Beach, Theodore Dreiser, and George Barr McCutcheon, asking for what would come to be known as "publicity blurbs." Additionally, Knopf's enthusiasm for Conrad led him to contact H.L. Mencken, also a Conrad admirer, initiating a close friendship that would last until Mencken's death in 1956. In March 1914, Knopf left Doubleday to join Mitchell Kennerley's firm, in part because of Kennerley's commitment to good book design. While there, Knopf wrote sales letters and sold books on the road. By 1915, at the age of twenty-three, Knopf was ready to strike out on his own. He did his own typography, design, and manufacturing arrangements and by mid 1915, Alfred A. Knopf, Inc. issued its first volume, a collection of four translated play scripts by nineteenth century French playwright, Émile Augier. With an initial investment of five thousand dollars, he began to compete with older established firms, which already had under contract many established American authors. He initially looked abroad for fresh talent and as a result his first major success was Green Mansions by W.H. Hudson, in 1916. The same year, Knopf married his assistant, Blanche Wolf. Throughout the years, Blanche Knopf (1894-1966) played a decisive and influential role within the Knopf firm with regard to the direction it would take. Within a short period of time, the Knopf publishing firm was able to establish itself as a major force in the publishing world, attracting established writers from the States and abroad. The company's emphasis on European, especially Russian, literature resulted in the choice of the borzoi as a colophon. At that time, European literature was largely neglected by American publishers. Knopf published authors such as Joseph Conrad, W. Somerset Maugham, D.H. Lawrence, E.M. Forster, Andre Gide, Jean-Paul Sartre, Simone de Beauvoir, Albert Camus, Thomas Mann, Sigmund Freud, and Franz Kafka. By 1917, of the 77 books Knopf had issued, more than a quarter were English while continental, Russian, and Asian writers accounted for almost half. In the 1920s, Knopf began acquiring such notable American authors as Willa Cather, Carl Van Vechten, and Joseph Hergesheimer. Later Knopf would also publish many other American authors, including H.L. Mencken, Theodore Dreiser, Vachel Lindsay, James M. Cain, Conrad Aiken, Dashiell Hammett, James Baldwin, John Updike, and Shirley Ann Grau. In the summer of 1918, he became president of the firm, a title he would hold for thirty-nine years. His imprint was respected for the intellectual quality of the books published under it, and the firm was widely praised for its clean book design and presentation. Though never the country’s largest publisher in terms of output or sales volume, Knopf’s Borzoi Books imprint developed a reputation for prestigious and scholarly works. Knopf's personal interest in the fields of history (he was a devoted member of the American Historical Association), sociology, and science also led to close friendships in the academic community with such noted scholars as Richard Hofstadter, Arthur Schlesinger, Jr., R. R. Palmer, and Samuel Eliot Morison. Sixteen Knopf authors—the largest number of any American publishing house—won Nobel Prizes in literature. Knopf himself was also an author. His writings include Some Random Recollections, Publishing Then and Now, Portrait of a Publisher, Blanche W. Knopf, July 30, 1894-June 4, 1966, and Sixty Photographs. With Blanche's considerable literary acumen and the financial expertise of his father (who joined the firm in 1921 as treasurer and remained in that post until his death, in 1932), Alfred A. Knopf, Inc. expanded rapidly during the 1920s and 1930s. In 1923, the firm published Khalil Gibran's The Prophet, which became one of its most successful sellers. When he was not invited to join the established publishing associations, he formed the Book Table, a luncheon group made up of publishers, book sellers, librarians, and other literary figures. Between 1924 and 1934, Knopf served as publisher of the iconoclastic magazine The American Mercury, edited until 1933 by H. L. Mencken. In 1934, William A. Koshland joined the company, and remained associated with the firm for more than fifty years, rising to President and Chairman of the Board. The firm weathered its first financial crisis in 1935. Book sales took a dramatic plunge after the introduction of sound to motion pictures in 1927, and reached a low-point for the century in 1933, then recovered somewhat to remain relatively flat during the rest of the decade. World War II temporarily cut off American access to European writers. In the interim, Blanch Knopf became interested in Latin American writers. In 1942, Blanche Knopf visited South America, contacting authors and publishers. Three years later, the firm published the first of many texts from the region, Jorge Amado's The Violent Land. At the end of World War II, Alfred Knopf turned over the European side of the business to Mrs. Knopf, and she traveled to the continent almost yearly. Among the writers she successfully courted were Elizabeth Bowen, Hammond Innes, Angela Thirkell, Alan Sillitoe, Mikhail Sholokhov, Mario Soldati, and Elinor Wylie. Mrs. Knopf read and selected manuscripts from all of Europe, but her most passionate interest lay in French literature. A life-long Francophile, she brought Albert Camus, Andre Gide, Jules Romains, and Jean-Paul Sartre to the firm. She was named a Chevalier de la Legion d'honneur by the French government in 1949, and became an Officier de la Legion d'honneur in 1960. The Knopfs hired their son, Alfred "Pat" Jr., as secretary and trade books manager after the war. By 1945, as the country surged into the post-war prosperity, Knopf’s business flourished. After more than a quarter-century in publishing he had a well-earned reputation for quality book production and excellent writing. In 1954, Pat Knopf added Vintage Books, a paperback imprint, to the firm. Blanche Knopf became president of the firm in 1957. In 1959, Pat left to form his own publishing house, Atheneum. Shortly after Par left, Alfred and Blanche Knopf decided to sell the firm to Random House in April 1960. In an agreement with long-time friends Bennett Cerf and Donald S. Klopfer, Random House took over much of the technical side of the business, but allowed the firm to retain its autonomy as an imprint. Alfred and Blanche Knopf also joined the Board of Directors at Random House. Knopf retained complete editorial control for five years, and then gave up only his right to veto other editors' manuscript selections. The editorial departments of the two companies remain separate, and Knopf, Inc., retains its distinctive character. Knopf called the merger "a perfect marriage." After Blanche's death in 1966, William A. Koshland became president and two years later, Robert Gottlieb, formerly of Simon and Schuster, joined the firm as vice-president. Gottlieb became president and editor in chief after Alfred Knopf's official retirement in 1973. Gottlieb remained at Knopf until 1987, when Ajai Singh "Sonny" Mehta became president. Later Random House, a subsidiary of RCA, was subsequently bought by S.I. Newhouse and in turn, it eventually became a division of Bertelsmann AG, a large multinational media company. The Knopf imprint had survived all the buyouts and mergers as of 2008. On June 21, 1948, the Knopfs began a cross-country automobile trip that would prove to have an enormous influence on the rest of Alfred Knopf’s life. When they entered Yellowstone, Alfred was deeply affected by the scope of the high plains and scenery of Yellowstone. "The West has gotten in my blood something awful,” Knopf confessed candidly to Wallace Stegner, “I have just got to go out there again to make sure it's real." From that time on, Knopf planned a long working vacation in the West every summer. Knopf’s most substantial contribution to conservation was not his publishing record but his work with conservation groups of the 1950s and 1960s. Between 1950 and 1975, in addition to the National Park Service board he served on the Sierra Club national advisory board, Trustees for Conservation, Citizens’ Committee on Natural Resources, the American Scenic and Historic Preservation Society, and many others. As both a staunch Republican and one of the most recognizable names in publishing, his word carried weight and opened doors where others were sometimes casually dismissed. He was decidedly pro-business in most matters, yet he did not give an inch when it came to criticizing exploitive private-industry legislation or federal largess to corporations. Knopf was not interested in multiple-use policies or in recreation. He was a preservationist at heart. He favored the legal protections due parks over the usage rules which managed reserves, the values of preservation over the issues of conservation, and public rather than private stewardship. Blanche Knopf died in June 1966. After Blanche's death, Knopf remarried the former Knopf author Helen Hedrick in 1967, in Rio de Janeiro. He officially retired in 1972, becoming chairman emeritus of the firm, a position he held until his death. He remained active after his retirement, traveling until a series of strokes precluded his leaving home. Knopf died August 11, 1984, of congestive heart failure at his estate in Purchase, New York. Knopf's achievements as a publisher of distinguished books brought him half a dozen honorary degrees, as well as decorations from the Polish and Brazilian governments. In addition, his service on the advisory board of the National Parks Commission and his tireless efforts on behalf of conservation earned him numerous awards. The Alfred A. and Blanche Knopf Library is a result of a visit to Texas, in 1959, when the Knopfs agreed to give The University of Texas large portions of their library, along with the company's voluminous archive. The archive (669 boxes) is housed at the Harry Ransom Center at the University of Texas at Austin. Knopf, Alfred A. 1949. Some Random Recollections; An Informal Talk made at the Grolier Club, New York, 21 October 1948. New York: The Typophiles. Knopf, Alfred A. 1964. Publishing Then and Now, 1912-1964. The R.R. Bowker memorial lectures . New York: New York Public Library. Knopf, Alfred A. 1965. Portrait of a Publisher 1915-1965. 1, Reminiscences and Reflections. Typophile chap books, 42. New York: The Typophiles. Knopf, Alfred A. 1966. Blanche W. Knopf, July 30, 1894-June 4, 1966. Alfred A. Knopf, Inc. 1925. The Borzoi 1925; Being a Sort of Record of Ten Years of Publishing. Louis De Rochemont Associates, and Alfred A. Knopf. 1961. A Publisher is Known by the Company he Keeps. New York: Louis de Rochemont Associates. Knopf, Alfred A. 1975. Sixty Photographs: To Celebrate the Sixtieth Anniversary of Alfred A. Knopf, Publisher. New York: Knopf. ISBN 0394498925. ↑ University of Texas, Alfred A. Knopf Inc. Retrieved July 16, 2008. ↑ Richard L. Saunders, Alfred A. Knopf and American Conservation. Retrieved July 16, 2008. ↑ www.nypl.org, Historical Note. Retrieved July 16, 2008. ↑ University of Texas, Biographical Sketch. Retrieved July 16, 2008. Bobotis, Norma C. 1969. History of the Publishing House Alfred A. Knopf, Inc., 1915-1960. Henderson, Cathy, and Dave Oliphant. 1995. The Company They Kept: Alfred A. and Blanche W. Knopf, Publishers: An Exhibition Catalog. Austin: Harry Ransom Humanities Research Center, University of Texas at Austin. ISBN 0879591358. Tebbel, John William. 1972. A History of Book Publishing in the United States. New York: R.R. Bowker Co. ISBN 0835204898. Encyclopedia of World Biography Encyclopedia.com. Usborne, David. 2007. Alfred A Knopf: How the great literary publisher proved to be the great rejecter Independent.co.uk. History of "Alfred A. Knopf (person)"
This page was last modified on 11 November 2016, at 16:21.